During last few days I was in a huge hunt for recipes, that’s the reason for only 2 posts in May. Finally I settled on spicy mutton stew, it is a common style of cooking mutton/lamb in India. It gives a great flavor of its own juice. Actually stew is a combination of meat and vegetables that are simmered and cooked for a longtime. Lots of people think Indians do not make stew very often but pretty much many people make stew very often, most of us don’t know this is called stew. Like most of the time we make meat and potato it is a kind of stew but it doesn’t have everything in it to call it mutton stew. Don’t worry today I am going to tell you the recipe of making lamb/mutton stew in a quick process. The recipe I have given here is good for 3-4 people if you don’t overeat. Wash the meat and drain all the water from it. Add flour and salt to it, coat it well. Now in this oil add whole garam masala and shorted for a while, then add chopped onion and fry it for a while till it is soft, no need to make it brown. Add onion, ginger garlic paste, red chili powder, turmeric powder, coriander, and cumin powder and shorted it for two-three minute. Add yogurt, coconut milk and vinegar. Mix it well. Add vegetable to it and cover it for 4-5 minutes. Now time to add those 70% done meat to this gravy. Add one more cup of water and adjust according to your taste, cover it in a low flame and allow it to cook at least 30-40 minutes. So that the meat will become tender and your vegetables will become nicely cooked. 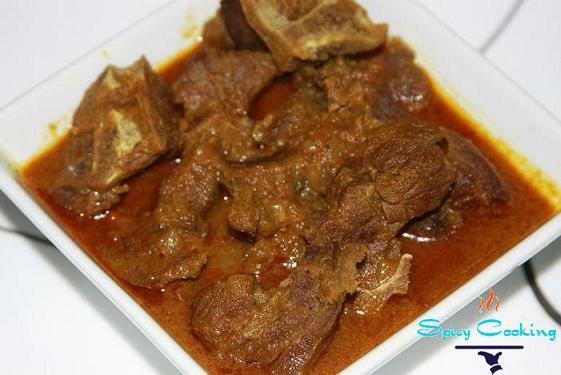 Now your mutton stew is ready to serve, you can serve it hot with rice/paratha/naan, whatever you like. I love to eat this with rice. Enjoy your stew and do not forget to leave me a comment with your experience. Hi, I never cooked lamb at home. I ate it few times in restaurant but found it hard, not soft like chicken or goat. Do you think it is tasty, it seems to be good. Let me know if you want a person like me should try to cook lamb at home or not. But it looks awesome..
Hi Priya, Ya lamb is little bit harder than chicken and goat meat but you can try it at home, if you want to make it little soft add 1tsp of vinegar to it and let it rest for half n hour after that you can follow my steps. Try it once in your kitchen and let me know how your lamb stew comes out.